Like many of you, I buy books and leave them piled up for the day I can eventually read them. 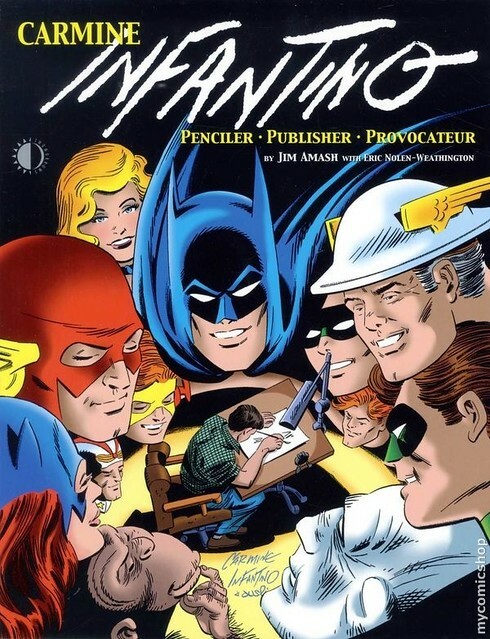 When TwoMorrows announced that Jim Amash and Eric Nolen-Weathington were working on Carmine Infantino: Penciler, Publisher, Provocateur, I pre-ordered immediately. I even got the deluxe hardcover that came with a nifty Infantino sketch of The Flash. The book arrived last Fall, but I just read it this weekend. For any fan of comics history, this book is a goldmine. It traces Infantino’s career from his early days working in the Golden Age of comics (for people like Joe Simon and Jack Kirby) to his transformative Silver Age run to his years as DC Comics publisher. It is one long interview for over 160 pages, profusely illustrated with artwork, sketches, and photographs. The Golden Age period from Infantino’s perspective is very interesting, especially his description of Jack Kirby producing pages at a level of quality that was unmatched by anyone. I was always curious about how Infantino’s style evolved from the Golden to the Silver Age period. Early in his career, artists like Milton Caniff obviously were a big influence and that was reflected in the Golden Age Flash stories. Infantino had a strong desire to be a better artist and he studied for a few years in the early 50s at the Art Students League with Professor William McNulty. This experience was a big influence on Infantino, teaching him about design, positive/negative space, and a love for Frank Lloyd Wright’s architecture. There was a period of experimentation for Infantino where he adjusted his style, which irritated editor Julius Schwartz to no end. 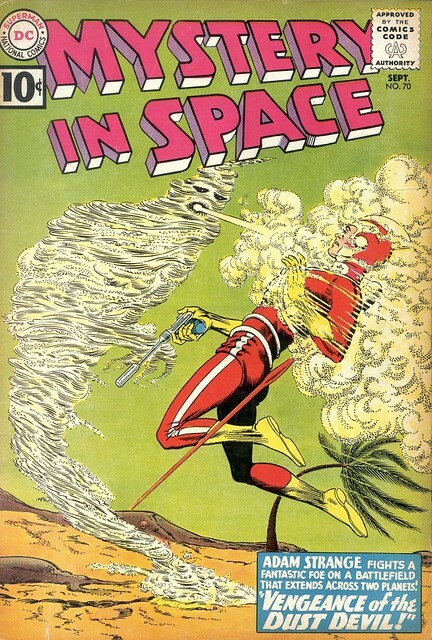 Fortunately, by the time the Silver Age version of the Flash launched in Showcase #4, Infantino was more than ready. Man, this book really brings back a lot of great Silver Age memories. 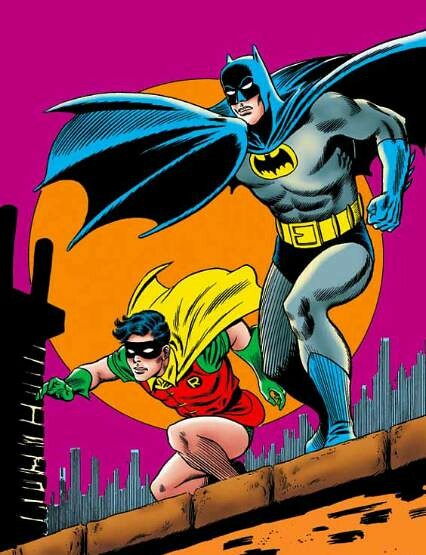 One was this poster of Batman and Robin, probably the first superhero merchandise I ever bought. I recall there was a glow in the dark version of this one? I had it over my bed when I was enamored of the Adam West TV show. Infantino was paid $30 for the illustration which was used by the Licensing Corporation of America on all kinds of products. He was a bit miffed that no one compensated him further for any of the merchandising—which happened to almost all of Marvel and DC’s classic artists. Carmine Infantino drew two of DC’s top characters with the Flash and Batman. But I’ll always remember the offbeat characters that he drew: Adam Strange, Animal Man, Elongated Man, Super-Chief, Strange Sports Stories, etc. I didn’t realize that Infantino created the visual for the first appearance of Black Canary. And those crazy hands coming out of the captions—Infantino came up with that idea because he never read captions! I became interested in a character I had never read before: Pow-Wow Smith, the Sioux Indian Sheriff from Western Comics. Infantino created that character, too. How did Carmine Infantino go from being DC’s top artist to the editor in chief and publisher? This book will tell you, in Infantino’s own words. One thing I had never considered before: what if Infantino had not taken a corporate job and had remained an artist? Would his style and storytelling have evolved into something even greater? He asks that question himself and it is interesting to ponder. I had always wondered what it must have been like for Infantino to transition from publisher back to working artist at places like Warren and Marvel Comics. That is also covered in these interviews. It wasn’t easy for him but he still produced some great work during this period. You will also get Infantino’s thoughts on the death of the Flash (in the first Crisis), Sue Digby/Elongated Man in Identity Crisis, and what he thinks of modern comics. Can’t recommend this highly enough for all Infantino and DC Comics fans. Nuff Said!